Yep. Nothing breathes like mail. It’s the fabric of your afterlife. Yay~! Fashion show! That is a really pretty blue. It looks good on him. Thanks! This is what he’ll wear the rest of the story but it’s weird getting rid of the purple. Been almost three years! Also, you never know when Loki might mistake his back for a sheath again. After all, his stuff was just mended. Exactly. Though Loki won’t be doing that anymore. 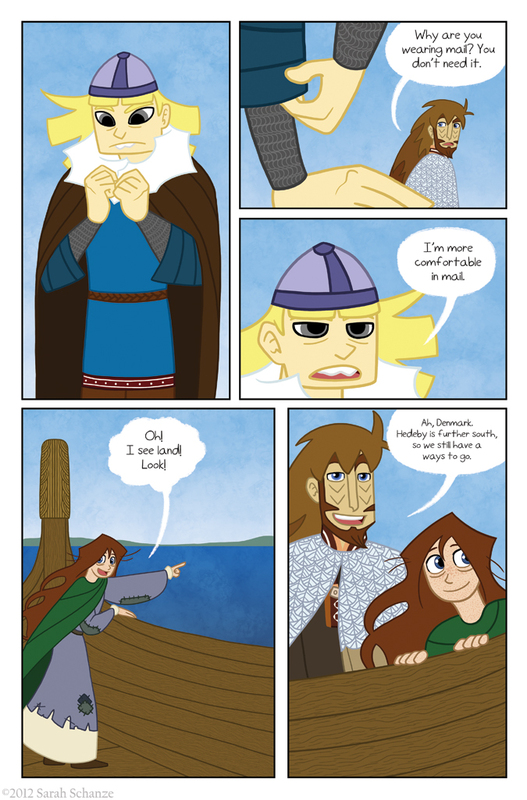 It’s a good thing Hedda has no idea how boats work, because I don’t think I’ve even seen Coal or Loki pretend to sail. Hane’s chain, Michel Jordan couldn’t make i look good. I just read this comic recently and am loving it. Sigyn/Loki is so lovely. Oh and I am so loving Loki. And the last panel made me think that Loki and Hedda look like err… Father/Daughter. More please?? Getting stabbed in the back probably would make one consider wearing body armor. Love Coal’s new outfit, the blue tunic and the mail really suit him! (Though us readers have recently discovered he looks great without any sort of clothing on his top half XD) Can’t wait to see Hedeby, keep it up, Rollo! Hahaha, thanks! Hedeby will be coming up soon. Hopefully it will be the only town they go to cuz drawing buildings is not fun. Haha, we’ll say he is. >3> I didn’t think of that till I’d already designed it. Coal wouldn’t be uncomfortable anyway, since he’s dead and wouldn’t feel it. Well, death sure does have a way of messing with your senses!